Clooney and the boys go huntin’ Nazis (that stole a bunch of art). When you hear the names George Clooney, Matt Damon, Cate Blanchett, and John Goodman, one of the first things you think of is that this is a good group of actors. Some of them have Oscars while the others have been nominated for them. They’re respected in their craft, and you expect high-quality performances from them. And herein lies part of the issue that many people will have with The Monuments Men, Clooney’s fifth directorial film; with such a heavy-hitting cast your expectation level for the film may be a wee bit too high. The Monuments Men tells the story of a platoon of artistic-minded men who are put together and tasked with locating and preserving artwork in Europe that have been stolen by the Nazis during World War II. A lofty goal to be sure, yet one that is indeed factual as the film is based on actual people and events. The fact of the matter is that with the big names and the humanitarian premise of the film, what we hope for the film is not what is delivered. What we do get is an interesting story with actors that are not utilized to the best of their potential. Don’t get me wrong; I like almost everyone in this film, and while they all do a good job, there’s just not that much in the screenplay to make any of them really shine. Damon really stepped in it on this one. What compounds this issue is the fact that this movie is more of an ensemble piece rather than focused on any one character. You get great one-on-one relationship development between everyone as they break up and venture across Europe: Murray’s and Balaban’s characters encountering a lost German soldier, Goodman’s and Dujardin’s characters getting shot at outside of a church, Damon’s character trying to win over Blanchett’s. While we see all of them bond together and buy into the mission in both comedic and emotive ways, nothing really sets the screen on fire. I almost felt that other potentially less recognized actors could have just as easily been in these roles. The bigger story with The Monuments Men is the story itself. Clooney is out to shine a light on this little known piece of the war. While the story is interesting, the film only really scratches the surface of its central theme: Is art more important than a man’s life? You have to imagine now that this is taking place during the middle of World War II. Allied forces have just landed in Normandy, and the main focus is on defeating the Germans–not saving art. Any resources or personnel dedicated to an ulterior objective doesn’t make sense to most military minds when there are Nazis to fight. The making of another Hitler Downfall video in progress. While Clooney’s character Lt. Stokes gives several monologues during the film to this central question, I thought it was one or two moments from the film that really illustrated an answer to this question. This is a film that is set during World War II, so it shouldn’t be much of a spoiler to say that people die in this movie. It’s how they die and what they die for that really answers the question. Towards the end of the film Stokes is directly asked this question, and while I won’t reveal the answer, how he responds is made pretty obvious from the events that took place in the film, and I wish there were more of these thought-provoking moments to be had. Overall, there’s nothing really bad about this film. The performances are all good and entertaining, but they don’t really reach epic proportions. The story of these men and the story of what the Nazis were trying to do are definitely the emphasis as a lot of it really makes you wonder how much artwork we did end up losing to the war. If the worst I can say is that I lament the lost potential for a film like this, then while it’s not great, it ain’t bad either. The Monuments Men is now playing in theaters everywhere. Yesterday we looked at the Actress categories for this year’s Oscars, today we focus on the Actor categories. In one race you pretty much have a sure thing, in the other you could have a major upset. Read on to find out which is which. Ever since I saw The Descendants back at HIFF in October, I’ve loved the film and Clooney’s performance. Sure he’s had bigger roles, but he plays sad-sack dad Matt King so picture perfect. The look in his eyes, the way he struggles to be father, dealing with his father in law–Clooney’s portrayal is the genuine thing. There’s just something about his performance that felt really true to me. I liked Clooney a couple of years ago in Up in the Air. This time though, I think we get a little more from him. He’s won a Supporting Oscar and has been nominated for Lead Actor before, but I think Clooney should take home gold this year. On everyone else . . .
Demián Bichir: The story from A Better Life isn’t something a lot of us can relate to, which makes it all that more poignant for people to check out. As I was watching the film the whole time the title echoed in the back of my mind as Bichir’s character, Carlos Galindo, tries to better his station in life so that he can provide for his son. Bichir gives a subtle performance and you can feel his character trying to be different things: on one hand he’s trying to be a provider, on the other he’s afraid of being deported and losing his son. Bichir also gets a chance to shine at the end with a monologue that gets the waterworks going. In the end, though good, I wanted to see more depth from his character. Jean Dujardin: The same thing I said about Bérénice Bejo in the Supporting Actress category I’ll say again for Dujardin . . . though I thought his performance was really great in The Artist, to win Best Actor, I need to hear you speak. Just like Bejo, Dujardin gives a great performance and he really says a lot with body language, mannerisms, and facial expressions. I just want to know that he has the whole package before I can give him this award. Gary Oldman: I love Gary Oldman and the man has done a lot of great work, I just don’t think he does enough in Tinker Tailor Soldier Spy. George Smiley maybe a smart and cunning Mi6 agent, but animated and expressive he is not. While I didn’t think it was a bad performance by Oldman he does not have a lot to do with his character. Though I hate to say it, the nomination may be the reward for Oldman (it’s his one and only Oscar nomination to date). Brad Pitt: If I had to pick a second place Oscar or if Clooney wasn’t as good, I’d probably give it to Pitt for taking on the role of Oakland A’s general manager Billy Beane in Moneyball. I was only lukewarm on the film when it first came out, but the more I think about it, the more I see that it’s better than I originally thought. It’s not your typical sports movie that’s for sure, but Pitt definitely turns in a great performance. Sure he has the typical Brad Pitt like moments where he gets to be that smug guy, but he also has some great moments where its him and the baseball field or when it’s just him and Jonah Hill trying to figure things out that really elevate his performance. Great editing may have helped, but there are moments in the film when you see Pitt as Beane alone with his thoughts. Nothing is spoken, but you can hear his character’s thoughts–all conveyed by the way Pitt looks. Dujardin has been the favorite for a while and has already picked up a Golden Globe, Screen Actors Guild award, and a British Academy of Film & Television Arts (BAFTA) award for his lead performance in The Artist. I even thought he was all but a lock to win after his Funny or Die audition sketch and appearance on SNL with Zooey Deschanel. With him jumping into the mainstream-how could you NOT vote for the guy? However after reading this post by Oscar reporter Anne Thompson, a split in the voting could lead to anyone winning the award. Though Dujardin is the favorite, don’t be surprised if someone else sneaks by for the win. This is another case where the supporting category has a clear frontrunner (and most likely a winner). Plummer’s turn as Ewan McGregor’s father who’s recently come out of the closet at such a late age and is also dying of cancer make for a great mix of comedic and dramatic moments from his character in Beginners. The portrayal of balance that Plummer shows in the role of this man trying to finally live his life under the cloud of cancer hangs over all of it definitely hits the right tones at the right moments. They feel real as the character struggles with life and death. Jonah Hill: Though it wasn’t overly dramatic, it was great to see Jonah Hill stretch his acting chops in Moneyball. They had some comedic lines and moments for him to put his own stamp on the character, but he also did a great job in a really understated role. Again, I think the nomination is the reward here as I’d like to see more from Hill in the future. Nick Nolte: The recovered alcoholic father Paddy Conlon in Warrior was probably THE perfect role Nolte. Throughout the entire film I felt really bad for this guy. He seemed to have put his destructive ways behind him and was making a heartfelt effort to bridge the relationship with his sons and they just wouldn’t have it. The agony on his face every time one of his sons rejected him was just so heartbreaking. Then there was the stereotypical emotional moment that story-wise felt forced, but acting wise was great. Kenneth Branagh & Max von Sydow: Did not view My Week With Marilyn or Extremely Loud and Incredibly Close. It’s definitely hard to speak to who should actually win this category when I hear that the two performances that I haven’t seen (Branagh & von Sydow) are pretty good in their own right. However, all the Oscar talk I’ve read points to all signs for the gold to go to Plummer. He has a long and distinguished career and he’s been giving a number of wonderful interviews in the past two months. Like his counterpart in the Supporting Actress category Octavia Spencer, he too has won a Golden Globe, SAG award, and BAFTA award for his supporting role in Beginners. This year, he’ll take home his first Oscar as well. That’s it for today. Stay tuned tomorrow as we leave the acting categories behind and take a look at both Short Film categories which you can catch right now at Consolidated Kahala 8. More Oscar Watch Reading . . . I know, I know, I’m still writing stuff on HIFF. It’s such a huge film event here in Hawaii that it warrants a lot of coverage by a movie blog based in Hawaii. I promise you though that this will be pretty much the last post on this year’s festival. So please, bear with me as I put down a few more thoughts on the closing days of HIFF 31 in order to try and wrap things up. So my last day/s of volunteering didn’t provide as much writing material and hence, this small section is going to close out my experience working as a volunteer at this year’s festival. The one thing I did want to mention again, is that you can end up working with some really cool people as a volunteer. HIFF volunteers direct festival attendees to the appropriate theater. On the lone Tuesday night of the festival, I was put into this team of three and we were posted at theater 12. Sadly I can’t remember my teammates names, but it was me, this other guy that I had worked with on Saturday, and this girl. I don’t know how it came up, but it eventually came out that we were all the same age as we were all born in 1980. I mean, I’m sure the odds of something like that happening were way more possible than say me winning the lottery, but at the time I found it pretty striking. With some common ground between us, we started chatting away as we worked. Of course, the conversation turned towards where we lived and where we were from. Through all of our conversation up until this point I had just assumed that we were all locals. Nothing that anyone had said would have given me reason to think otherwise. However, the other guy in our group told us that he was originally from Houston, Texas. This sparked an amazing conversation on how he came to be in Hawaii and of his travels around the world. It started off with the usual questions; we asked him what he was doing here in Hawaii, how long he had been here, where he was before he came here. Come to find out that he was watching his friend’s house while he was deployed. Since his friend had a car as well, he even had a car to get around in. How he got here was pretty cool too (figuratively, not literally). Basically his friend called him up towards the end of last year and asked if him if he wanted to live in Hawaii while he was deployed. At the time he was finishing up his stay in Australia and he didn’t really have anything else to do so he took his friend up on his offer. Naturally the question of “well what were doing in Australia” came up. This pretty much lead into a whirlwind tour of my teammate’s travels around the world. He told us that he was in Australia for volunteer work and it was through the volunteer service that placed him there that he’d traveled all over. He then told us about his experience volunteering in Ethiopia, what life was like there, and about the Internet cafes they had there. The whole time I was listening I was pretty amazed. He was such a low key guy and he had these interesting stories about where he’d been. He even told us that he was a fugitive in Australia. He got fined for trespassing down there and he was supposed to appear in court. The thing was, his court date was a week or two after his flight to Hawaii. He said they’d probably never let him back into the country for skipping town, but he wasn’t heartbroken about it since he had already seen the country and didn’t really need to go back. Teammates, volunteers, festival friends, call them what you will. You meet these people possibly one night out of the festival and never see them again till the spring or the following year. Working with a good group of people will make the time just fly by while working with not so great people . . . well, let’s just say that’ll probably make for some fun stories. Whatever the case may be, you’re going to meet interesting people when you volunteer at HIFF. The George Clooney cardboard cutout was a big hit on the final night of the festival. Going into the festival, I (along with everyone else) knew that Descendants director, Alexander Payne, was going to be here for closing night. It was reported by the Star-Advertiser and other media outlets. Hollywood film, shot in Hawaii, about Hawaii, and the director was going to be here to receive an award and talk about the film . . . yeah, even before the festival started you knew closing night was going to be crazy. What I wasn’t expecting though, was the rumor mill buzzing about how George Clooney might be coming to the festival as well. I heard people talking about this from opening night! No one really knew for sure if he was coming, but it seemed as if everyone had heard from someone that an effort had been made to bring him out here. Now I’m sure Clooney was reached out to and asked to attend, however from the way people were talking about it, it seemed as if everyone thought he would make an appearance and that it was just this secret that was under wraps. I knew from the beginning that Clooney wasn’t going to be here. There’s no way something like that could be kept a secret, it would have been reported somewhere. And also, this isn’t Telluride or Comic-Con where stuff is kept secret up until the moment it happens. No, if Clooney was coming, everyone would know. Fast forward to closing night. I didn’t know it as we walked through the lobby, but George Clooney did show up for this year’s HIFF. He was in the lobby in front of the HIFF sponsor backdrop posing for pictures with guests. Ok, well, it wasn’t the real George Clooney, it was a cardboard cutout of him. It was really fun to see everyone wanting to take their pictures with the cutout and I thought it was a really great way to use the buzz surrounding the rumors of his appearance to engage festival attendees. So just how did the festival get “Clooney” to show up? Festival director Joshua Nye said he had a brainstorm Friday night about the Clooney cutout and rushed out to get it made in time for the closing night film on Sunday. And what of the closing night film itself? Call me a homer, but I loved The Descendants. I thought Clooney was great in the lead role of Matt King and I especially liked the relationship that he had with his daughters. Overall I thought the entire ensemble cast did good job, even down to Matt Lilliard who, when I saw his name come up in the opening credits I was like, “Ugh, not the guy from Scooby Doo!” However, I thought he had a great understated performance that didn’t make me think about his previous roles. During the post film Q&A with director Alexander Payne, he talked a lot about how he wanted to get things right about Hawaii and even went so far as to live here for a few months before shooting began to get a good feel for Hawaii. All of Payne’s hard work definitely shows in the film. The way that our local lifestyle is depicted, from family gatherings, right down to the main character of Matt King–everything felt pretty authentic to me. I personally don’t know anyone like Matt King, but there are people like that here. They may not look local, or they may not act local, but they ARE local. And it was things like that that I appreciated from the film. Anytime you have a film with George Clooney claiming Hawaiian, I’ll take that movie any day of the week. So yeah, like a lot of other locals, I really enjoyed The Descendants and I’m putting it in my Top 10 films of 2011. Overall I had a really great experience this year, from both working as a volunteer and as a festival goer. If I had to say, I think I enjoyed more of the festival this year than I did last year. From the perspective of the blog, I definitely covered more than I have in the past. Things were really going good in the beginning when I had five or six days of consecutive posts and for a brief time I thought I could keep that pace. Sadly though reality eventually set in and I decided to choose sleep (and other real world responsibilities) over posting. Though I didn’t get to see everything that I wanted to, which would have been physically impossible, I do know which films I want to look out for should they make their way to theaters within the next few month or appear on Netflix. One takeaway from this year’s festival that will stand out for me is what local filmmakers are doing here in Hawaii. I’ve always been hesitant to check out local productions only because for such a long time there hasn’t been anything all that great. From commercials to the stuff on OC16, there is a lot of locally produced stuff that is really lame, kinda cheesy, or just plain tacky–and it was because of all of this that turned me off from local productions. Paradise Broken changed all that. It made me realize that we do have people who are doing great things in Hawaii. Like anything else, some things are going to be better than others and if you search for it, you will find quality work and storytelling going on here. So I think that’s going to do it for this year’s Hawaii International Film Festival. Definitely some good times. If you enjoyed the festival this year or if you have anything to add, go ahead and hit me up in the comments. 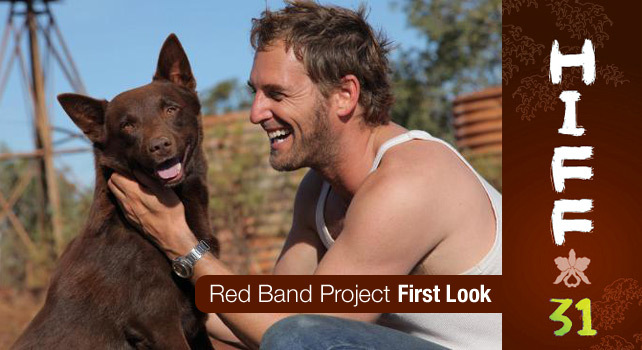 HIFF watch has officially begun and of course a dirty RED DOG is The Red Band Project's most anticipated film at this year's fest. The fall. It’s that time of year between the summer blockbusters and the start of Oscar season. It’s also when Hollywood decides to dump more films on moviegoers that they aren’t all that interested in supporting, albeit a few glimmers of hope (Drive, Moneyball, Contagion). Thankfully though we have HIFF next month to help get us through these dark days of fall. Though it’s just a little over a week long, we can start looking forward to what’s in store for us for HIFF 31 by analyzing the films already announced, right now! Note: For trailers to the 13 films announced for HIFF 31, head over to their website where they have posts with trailers/descriptions for each of the films. The only other thing that intrigued me was Being Elmo: A Puppeteer’s Journey which describes the gentleman behind the famous Sesame Street character. It got lots of praise coming out of Sundance earlier this year (via /Film & Cinema Blend) and should definitely be a crowd-pleaser here as well. Whether I see this or not will depend on the schedule. What's George Clooney got to hide from? Why only the masses and masses of people that are going to try and see The Descendants on the closing night of HIFF. That's all. 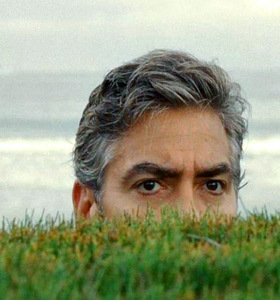 Though not officially announced or noted on the HIFF website, it is already being reported that The Descendants by Alexander Payne (Sideways, Election) starring George Clooney, will be the closing night film for this year’s HIFF. Generally a lot of people go to the opening night, centerpiece, gala, and closing night films because they’re bigger films, receive more publicity, and are showcase features for the festival. However, The Descendants has the distinct privilege of not only being a Hollywood picture, but as previously mentioned stars George Clooney, AND was shot here in Hawaii–a trifecta. The film was just screened at the Telluride Film Festival this weekend and is already garnering positive buzz from media outlets (via The Hollywood Reporter) and movie bloggers . . .
Now, normally I’m a mainstream Hollywood movie kind of guy and I’d JUMP at the chance to see this film. However, so is everybody else that’s coming to the festival. Right now I’m going to guarantee that the closing night of the festival is going to be a madhouse with everyone and their mother trying to get into this screening. And you know what . . . I’ll be right there with them! How you might ask? By not buying a ticket. Call me crazy, but I want to work the festival that night! With my event background, there’s just something about working big crowds that is pretty fun (and yes, pretty crazy sometimes too). Yeah, I do want to see The Descendants, but I really have no desire to even try to stand in line and fight a crowd to see it as a civilian. I can wait till Thanksgiving weekend when the picture has its theatrical release. I don’t mind waiting. And now we wait . . . While HIFF 31 is still a good month and a half away, I can’t help but get excited for it. What I’m interested to know is, if you’ve watched any of these trailers or know any more about these films, definitely let me know in the comments below if I’m missing something for those other films. Also, if you were at the special HIFF membership appreciation screening of Senna this week, I’d also like to hear your thoughts on these films as well. Let us know!